Situated on the small fishing island of Grimsay, between Benbecula and North Uist, Ardnastruban House offers a warm welcome, first class accommodation and magnificent views to the south and west towards the Atlantic coast. Relax in the friendly atmosphere as you soak up the ever changing mood of the Uist landscape. 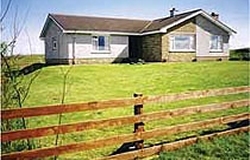 Perfectly situated for touring the islands and ideal for walkers and cyclists. Whether you come to birdwatch, fish, walk, explore or just watch the world go by, these beautiful islands will provide you with an experience to remember.